Health means having strong, positive relationships, safe neighborhoods, and access to healthy food and physical activity. United Way is making sure children enter schools ready to learn and students and adults are prepared for careers. United Way strives to provide access to resources that strengthen our community by serving families and individuals. We fight for health, education, stronger families, and a safety-net of services in times of crisis for people in Lee County. Success in life begins with a quality education. Many children, youth and adults lack the support they need to strengthen their literacy, stay on track in school, and find a career. United Way provides innovative solutions to help kids and adults succeed in school and in life. In our community individuals and families are facing challenges and obstacles that prevent a good quality of life. United Way provides access to community resources that give people the skills and support for success. Individuals in our community face uncertainty and lack of resources to better their health and wellness. United Way strives to provide access to healthcare, encourage healthy lifestyles through education and resources, and help people stay independent longer with a better quality of life. Rarely is anyone ever prepared for crisis in their life. We connect people to vital emergency services to help individuals and families get back on their feet. Change starts here! You are part of this great community. It is easy to get involved with United Way to create opportunities for a better life for everyone in our community! We encourage you to provide your personal email address so that we can keep you informed of the needs in our community and the inspiring work of the programs supported by the United Way! 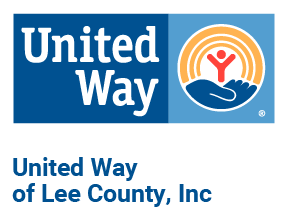 United Way of Lee County, Inc.
© 2019 United Way of Lee County. All Rights Reserved.